This RJ45 LAN tester is designed for a quick determination of the data service connected to a jack or port. The respective network topology, e.g. 10/100/1000 MB Ethernet and the network protocols VOIP/ PoE (Power over Ethernet), is detected within seconds. Thus it is easy, reliable and quick to determine which type of network signals are connected to patch ports or jacks with RJ45 ports. The RJ45 LAN tester even checks which duplex mode or whether auto navigation is generated. 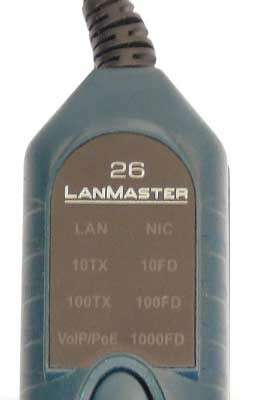 Additionally the LanMaster 26 identifies via the polarity whether a network interface card or a switch/ hub or router is connected. 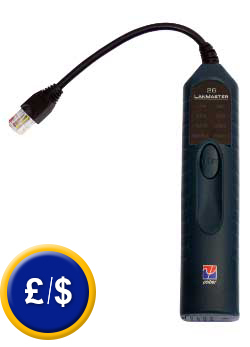 If there are any questions about this RJ45 LAN tester LanMaster 26, please have a look at the technical specification below or call: UK customers +44(0) 23 809 870 30 / US customers +1-410-387-7703. Our technicians and engineers will gladly advise you in all LAN testers and all products in the field of measuring instruments, regulation and control and scales.